Luke Shaw and Romelu Lukaku are "certain" Ole Gunnar Solskjaer will be Manchester United's next permanent manager as the clamour for his appointment grows after their historic Champions League comeback against Paris Saint-Germain - and the indications were last night that the club would make that move soon. Ed Woodward, United's executive vice-chairman, remained tight-lipped when quizzed about Solskjaer's future yesterday after seeing the club produce one of the greatest fightbacks in European Cup history to reach the quarter-finals. But there is a firm expectation among the players and senior staff that the Norwegian will be appointed well before the end of the season as the club bid to avoid any complications to their summer transfer plans and the demand for his appointment reaches fever pitch. It is understood that the timing of any appointment is likely to be influenced by United's recruitment strategy since the club would want to avoid a situation where they are unable to reveal the identity of their next manager to associates of potential targets or assorted third parties. Players are less likely to commit to a club if they do not have assurances about who the manager will be, just as United are unlikely to welcome the prospect of information leaking before an announcement has been made. Solskjaer, who claims not to have been told if he has got the job, is already working with the club on transfer plans for next season, with Borussia Dortmund and England winger Jadon Sancho among the targets he has helped to identify. Gary Neville, the former United captain, said he would be surprised if Solskjaer was not awarded the job during the international break this month and Shaw and Lukaku - who have been galvanised by the caretaker manager after struggles under Mourinho - spoke for many in the dressing room when they said they thought the situation was now a fait accompli. 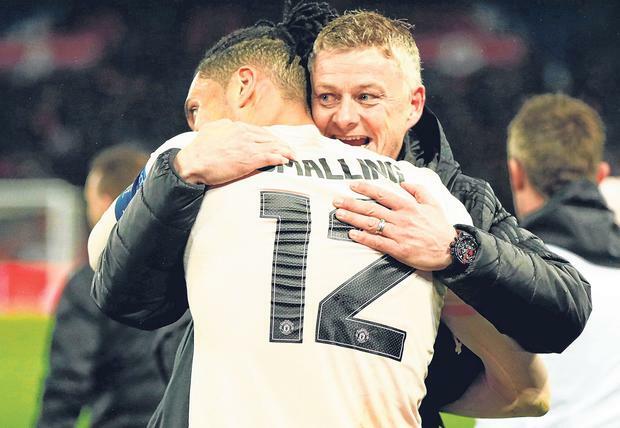 Solskjaer's name was sung lustily by United's players in the dressing room after the dramatic 3-1 win over PSG, when they became the first club in European Cup history to overturn a 2-0 home first-leg deficit - a far cry from the final weeks of Mourinho's reign when some players were no longer on speaking terms with the Portuguese. Woodward flew from Paris to Boston for personal reasons yesterday. Criticism of Woodward surged in the final months of last year as Mourinho floundered and Neville accused the executive vice-chairman of lacking "leadership" as well as questioning if he was fit to run the club. But the mood was very different at Charles de Gaulle airport yesterday when Woodward was asked to pose for pictures with jubilant supporters. United, who face Arsenal at the Emirates Stadium on Sunday as the battle for Champions League qualification next season heats up, remain committed to appointing a director of football to work closely with the manager and help shape the recruitment strategy, which has been heavily criticised in recent years. Woodward believes United's recruitment has been better than often characterised and that the bigger issue has centred around a failure to cultivate the talent in the squad.